As a child, Christian hated going to school. He was bullied and desperately wanted to be popular but he had no friends and did not believe in himself. Then he was diagnosed with severe heart failure and given just months to live. He chose to ignore his condition and, blessed with athletic ability, he represented Australia in Lacrosse and three other sports at the highest level. At the same time he started to volunteer in children’s hospitals all around the world to mentor patients with heart conditions. As fate would have it his heart shut down again just before qualification for the London Olympics and so he decided his new dream would be to become the world’s best teacher and inspire kids globally to live their dreams. Christian teaches maths through experiences and activities rather than worksheets, which both he and his class found boring. His students came up with an idea for a classroom coffee shop and created “56 Shots”, named after the number of parents who came in to learn about money with their kids. His classes have learned through trick shot videos and Skyped with university physics professors about time machines. He even persuaded a professional NBA basketball player to make personalised learning cards for a struggling student. Christian works with students on individualised passion projects and extension work before and after school. These projects have contributed to valued funding for several international schools in poverty-stricken areas. He additionally invests his time and money into each of his projects. Christian believes that physical activity plays a major role in making people happier and healthier. He created an iPhone app and a cooking show, “Cardio Christian”, to teach children about healthy eating and exercise. 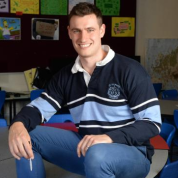 In 2015 Christian was named a finalist for Young Australian of The Year for his inspirational work in education. He was additionally recognised as a role model for children with heart disease to overcome adversity. He believes that physical activity is about making people happier and has created an iPhone app and a cooking show, “Cardio Christian”, to teach children about healthy eating and exercise. In 2015 Christian was named a finalist for Young Australian of The Year for his work inspiring children with heart disease to overcome adversity. Join the #TeachersMatter movement by sharing Christian Williams’ update.